Telecommuting — that is, working from home instead of a traditional office setting — offers employees freedom, flexibility, and nearly infinite pantlessness. No wonder it's a growing trend. 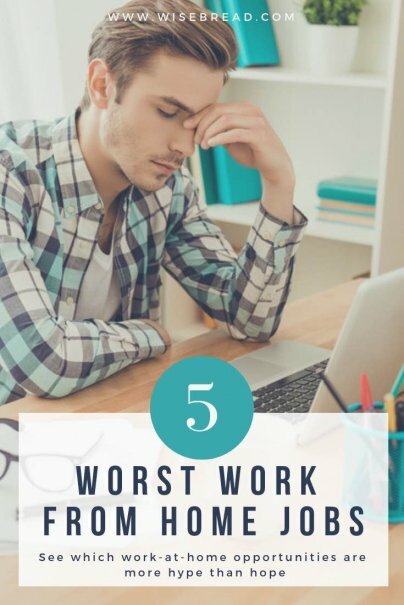 So before you start fantasizing about an at-home work day, take a look at some of the worst jobs you can do from home, and why they often don't pan out for remote workers. I admit to having done this job myself, over the course of six years. For the college student, retired person, or foodie who just wants a little "pocket change" and a free meal once in a while, shopping incognito in exchange for some honest feedback can be fun. Mystery shopping is realistically more of a hobby than a real career, however, as assignments pay far less than minimum wage in many instances, and signing up for a steady stream of jobs is exhausting. Many of the ads for work-at-home opportunities promise freedom from the 9 to 5, unlimited income potential, and the perks of being your own boss. These same ads, if they fail to mention exactly what it is you'll be doing, are often the first in many sales pitches to get people on board a multi-level marketing plan. MLMs aren't new, although the methods used to sell them are. All of them require some kind of upfront buy in (anywhere from $15 to $1,000) and only pay you when you sell the company's product or sign up friends and family to also sell the product. While there are cases of those who have achieved financial success with MLMs, there are many more cases of those who fail. The pressure to sell all the time, to everyone, in an often saturated market, often brings frustration and strain to the seller. MLMs are notorious for bringing success only to those who sign on in the early stages of the company. You can often tell if a job listing is an MLM in disguise by the failure to disclose just what it is you'll be doing or selling, along with a referral to a conference call or affiliate website to get "more information." Many of the customer service jobs listed on work-at-home job sites are nothing more than hard sales, often obtained by what are called "cold calls." Cold calling is essentially telemarketing to potential customers who have not previously expressed an interest in your product or service. Cold calling is a hard job because people today generally value their privacy and do not want to be contacted on their home or cell phone to be asked to buy something. Lead generation is necessary to gain more customers, but the turnover for these positions is high; many companies have found that having at-home workers do the job is more profitable than housing employees in a call center. Money can be made doing this job, although wages vary. Some companies pay a flat hourly rate that is competitive with formal telemarketing jobs, and others pay a straight commission (so you don't get paid anything unless you sell or make appointments.) If you have had experience telemarketing in the past and have been successful, this job could be for you. For the majority of those trying to escape the rat race, however, it's a difficult job that many people don't want happening in their own homes. Since the invention of Amazon's Mechanical Turk, other websites have popped up allowing everyday computer users to complete simple, mundane, and often repetitive tasks for money. These tasks can include everything from verifying the CAPTCHA characters on a web form to ranking web searches based on usefulness. The work involved in making money this way, however, is often more than people realize. First, available tasks fluctuate from season to season. Workers who can work odd hours (overnights, for example) often have a better chance at getting tasks than those who work when the majority of people are competing for tasks. Tasks are often paid out at a rate of just pennies per task, requiring hundreds of tasks to be done before the payout threshold can be met. (Many companies require a minimum of $50, for example, to be earned before they issue payment.) U.S. workers are often competing with international workers with a lower standard of living, as well; minimum wage expectations are often not met. A few years ago, caring for children in your home was considered a profitable endeavor, as the startup costs were low. For the stay-at-home mom, adding a child or two to your care used to be a reasonable way to increase income to the household budget without too much additional strain. As years have gone by, however, increased regulations and zoning laws have made it too much of a burden for the typical family to even consider. Transportation of children, even in a car, often requires liability insurance or additional driving licensure. Caring for even the youngest children may warrant college credits or outside classroom hours. Add in the cost of bookkeeping and the payment of self-employment taxes, and it's not worth it for the average person to do in many jurisdictions. Working from home can be an amazing experience. I have been doing so for over seven years, and I never regret my decision to leave the cubicle life. But not all work-at-home jobs are the same, and I encourage you to research before jumping head-first into any telecommute endeavor. Have you ever taken on any of these, or other, work-at-home jobs and been disappointed? Please share in comments. Taking surveys is another overly promoted scheme. First you have to "qualify". Then you have to reach a point threshold to get a payment. If you calculate the per survey payout it's about fifty cents each, or maybe a dollar an hour, for the qualifying surveys. Generally you are compensated little or nothing for the time you put into the qualification process.